Try your best to have family mealtimes. This teaches children skills needed for eating in a social situation, things such as passing food from person to person and serving food from bowls. Kids also like to help with setting the table & cleaning up after a meal. Having daily mealtime routines at a table with your family (instead of grazing on food while walking around or at the coffee table watching TV) sets up positive mealtime experiences for your young children. When established early, it also helps with restaurant behavior skills and knowing to sit at mealtimes. After all, how can you expect your two year old to sit and eat quietly in a restaurant if he’s never had the chance to practice and learn these skills at home? Think about it! Talk to your child about what they are eating. Discuss the color, taste, texture, temperature (hot vs cold), who prepared the food, etc. Some kids are dawdlers, some kids eat very fast. Limit all mealtimes to 30 minutes in order to pace your child at meals. 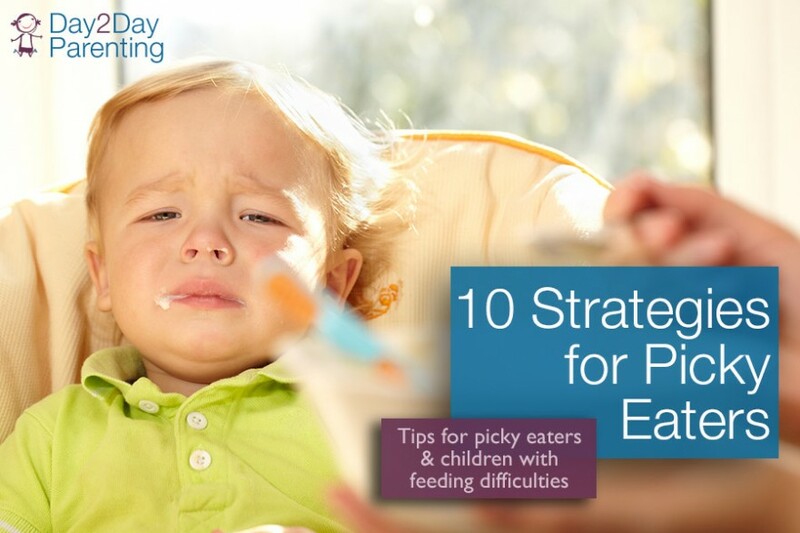 Don’t overwhelm your child with putting too much on his plate at one time. Follow serving size guidelines for the age of your child. If you are not sure about portion sizes, a general rule of thumb is to offer ONE tablespoon for each year of your child’s age. Many parents tend to over serve their child, then wonder why they aren’t cleaning the plate! In order to chew, swallow and eat easily children need to be positioned correctly. Children should be seated so they are stable, meaning not slouching to one side or the other, but sitting upright with feet supported and not dangling. You can tuck rolled blankets or towels inside highchairs for support or add more height to a foot rest if needed. If your child currently likes a certain texture of food, add new flavors of the same textured food gradually. When introducing a brand new food, do not assume your child doesn’t like if she does not immediately try it. Kids may need upwards of 15 presentations of a new food before they will actually eat it. So keep offering and praise all attempts at just touching, smelling or tasting foods, even if they did not eat it that day. Keep experiences with new foods positive! Try not to use foods for reward or punishment. Your child will learn many social skills and mealtime behaviors or habits at the dinner table. Keep meals fun, relaxed and enjoyable. Do not force your child to eat, clean her plate or punish her for not eating. Eating for little ones is messy! It is important that children use their hands to touch food & explore food. Encourage little ones to smell, lick & yes, even play with their food. 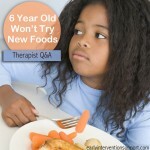 This increases your child’s likelihood of trying new foods and exploring new textures of foods. Resist the urge to wipe your child’s hands and face after every bite, instead wait until the end of the meal to clean up. Place a plastic table cloth under your child’s highchair and use a large bib, but allow hands and faces to get messy! Discourage grazing throughout the day and discourage carrying sippy cups around the house (especially those filled with juice) throughout the day. Children who graze and fill up on liquids are certainly less hungry and less willing to eat at regular mealtimes. Instead, offer your child 3 scheduled meals per day, with a morning and an afternoon snack. If your child is having difficulty with eating, is uncomfortable during eating, has a very limited diet, difficulty chewing/swallowing or chokes, gags or vomits at mealtimes seek the advice of your pediatrician, a pediatric feeding program or your local early intervention agency.